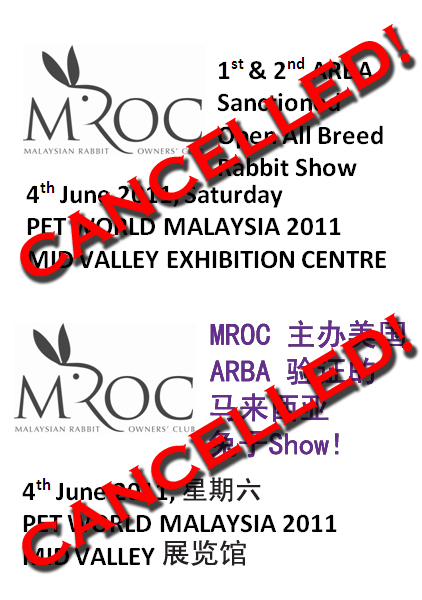 With a heavy heart, we have decided to cancel the rabbit show. And I would like to thank my Show Committee for all their support, trust and most of all for putting up with my “perfectionist” nature. My heartfelt thanks goes out especially to Brandon & Grace of Golden Pines Rabbitry, Cikgu Syah of Reko Rabbitry and Xazaquan of ZR Rabbitry. They have been a great bunch of people to work with. We really have fun and learned a lot although it wasn’t a successful one. We are not yet ready for a ARBA Show as the number of entries so far did not meet our expectations. Perhaps we’re moving too fast. So we find it inappropriate to invite our honourable judges all the way from USA just to judge a handful of rabbits. Nonetheless, I truly hope that the hobby will grow and perhaps in the future, we can all come together to organize a show again. Keep the SPIRIT of the RABBIT FEVER ALIVE!